The organ in the Chapel at Belton House near Grantham in Lincolnshire, https://www.nationaltrust.org.uk/belton-house, was built by Thomas Elliot for £458 10s 0d in 1826. In December 1828 it was visited by the organbuilder Alexander Buckingham who kept notes of his visit, and in the deprecating manner he used for his former master, Thomas Elliot, said that “the organ is very bad contrived to get to tune it and the chorus stops does not mix well together.” In 1831 he returned and moved the Swell nine inches towards the back “…for convenience of tuning…”. In 1833 he added a set of 17 pedals, and in 1842 he put in the Swell to Great coupler. In 1896 Bevington installed a Troy water engine, fed from the lake and rebuilt the bellows with cuckoo feeders. They also revoiced the Hautboy with new shallots. John Brownlow, Earl Brownlow and Viscount Alford, who bought the organ, also patronized music-making in Grantham, including a volume of sacred music written by William Dixon, who was organist of the chapel in the early nineteenth century, and organist at St Wulfram Grantham. These must have been performed at Belton too. The organ has two keyboards, a Great of 58 notes (GG AA to f³) and a Swell of 35 notes (gº to f³). The organ is in the Chapel Gallery. 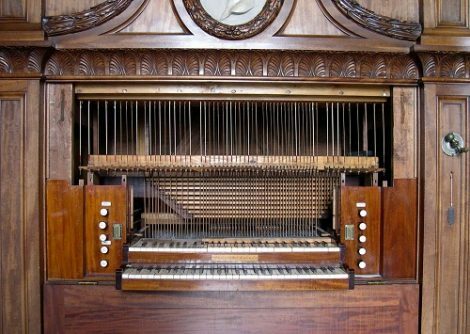 It has a fine mahogany case with a ceramic medallion of Handel above the single pipe flat, probably designed by Jeffry Wyatville. In the winter of 1997 to 1998 Martin Goetze and Stuart Dobbs restored the organ. The restoration work consisted mostly of cleaning and adjusting. The main parts of the work involved the two wind chests and the pipework. The chest had to be dismantled, the bar frame flooded, and the pallets re-leathered, in the style of the 1826 organ. The feet of most of the treble pipes had corroded and become misformed as a result. The corrosion probably originated in sulphur dioxide from the coal fire in the gallery, which condensed in the cold area of the pipe feet between the upperboard and rackboard, and acting with other impurities, produced blisters in the feet from the inside of the foot. The feet had become porous and brittle, and some of the corrosion was so severe that the feet had curled to one side. Since corrosion also expanded the metal and jammed the foot in the rackboard, some of the toes had lifted out of their uperboard holes. The feet were soaked in Paraloid B72 where not too misformed, or replaced by cutting off the affected section and replacing with new metal. The restoration project was entered for the Museums & Galleries Commission Conservation Awards and was shortlisted.